While we were in London we had to the chance to visit the National Gallery for the new exhibit, Monet & Architecture. I had booked this exhibition online months in advance in case it had sold out and I am so glad I did! It was a truly amazing exhibition covering so much of the artist's work. We were not able to take photographs in the gallery so I will be using images I found online to show my favourite pieces of the exhibit. I have seen a few Monet exhibits so far and this one was very unique in its own right. It focused on an overlooked aspect of Monet's work and that was his focus of architecture in his paintings. He used architecture to enliven his art and show the effects of light and weather on buildings by painting en plein air (outside.) Below were some of my favourite paintings on exhibit. I hope you enjoy just a snippet of this exhibition, however, if you find yourself in London before the exhibition ends on July 29, 2018, I would highly recommend taking the time to visit. Monet traveled a lot throughout his career to capture different cities throughout Europe. When he was visiting the Netherlands he was fascinated by the architecture, which can be seen in the image above. He wrote to his painter friend, Camille Pisarro that 'the houses in all sorts of colours, the hundreds of windmills and boats are ravishing.' In this painting above he pointed out the different shapes and style of the houses and how they reflect along the water. Monet once again uses light and reflections to give the viewer the perception of water in the foreground. I have been to Amsterdam before and his pieces that demonstrate the architecture there brought me back to the city immediately. Monet is able to capture a feeling through his painting and the gallery curated this wonderfully, transporting the viewers to the famous places Monet painted. This piece took my breath away when I saw it. The colours Monet achieves makes you think of summer in the south of France, the heat and the beautiful sea. This work depicts the gorge d'Ally, one of the ravines leading down from Varengeville to the sea. Monet paints deep within the shadow of the gorge, Monet looked out towards the sunlit Channel. The artist still depicts architecture here, however, it is a little more hidden than some of his pieces throughout the exhibition. The customs' officers' cabin can be made out to the upper left, its pitched roof echoing the natural parapets of the enclosing slopes. This image displays Monet's interest in different effects of light and weather, specifically snow here. When I first saw this piece in the exhibition I immediately felt what the artist was conveying. It felt cold and quiet just looking at a piece. This is one of the many reasons why I have always loved Monet's work because of how he is able to make the viewer feel by just looking at a painting. In this winter scene the artist paints his home village of Giverny with a mist that covers the frosty trees and frozen ground. Monet is able to create a unified surface of cold blues and lilacs through his brushstrokes. By including architecture here, the viewer is able to get a sense of both volume and human habitation. This painting is one that I have studied over and over again at university and fell in love with when I first saw it. The movement Monet is able to capture in this piece is truly incredible. Monet depicts the moment when strong wintry sunlight divides the boulevard des Capucines in two. The leafless trees cover the architecture of the buildings opposite and manage to hold the light. The artist's viewpoint is from the balcony of the first studio where the first 'Impressionist' exhibition was held in 1874 and where this painting was exhibited. One of the final rooms of the exhibition held five images of the same cathedral facade, Rouen Cathedral. This was by far my favourite room throughout the exhibit because of the way the gallery curated it. They hung all five paintings next to each other with benches in the centre of the room. If I could have taken a photo in any room it would have been this one, specifically of the people looking at the pieces. They were mesmerizing, not only in their large size but because of what Monet was able to capture in each individual canvas. The artist began painting these pieces in 1892 and returned to them again and again until about 1894. It was painted facing the frontal view of the facade. 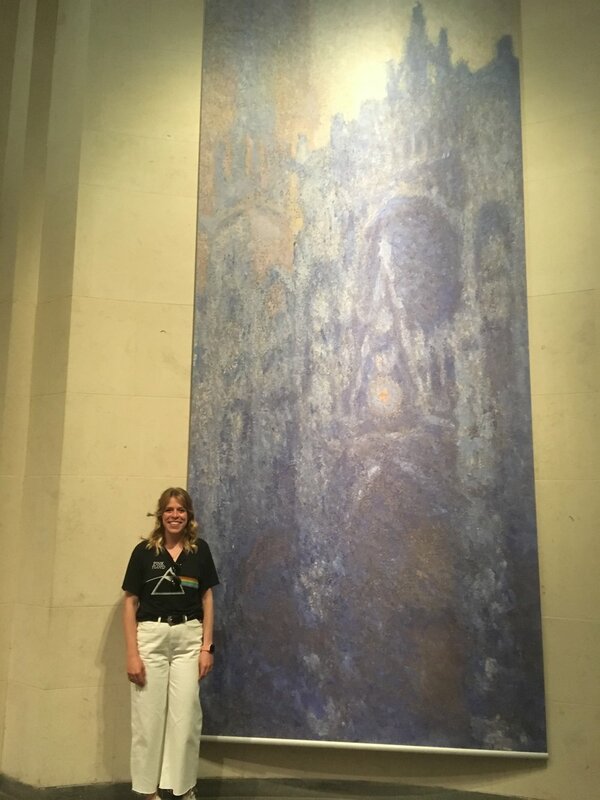 Monet was able to paint the cathedral with light from sunsets to sunrises. The artist painted the way the light danced on the cathedral different in each canvas. When hung together like they were in the gallery it was like you, the viewer, were able to see the sun rise and set through Monet's eyes. It was like nothing I had ever seen. Although there were many more paintings, 77 to be exact, as well as a film, these were some of my favourites. I hope that you enjoyed a little glimpse into this magnificent exhibition and you're able to see some of the pieces face to face one day. When I was visiting Vancouver in early February I had the chance to go to the Vancouver Art Gallery. We arrived on Saturday, just in time for Murakami's new exhibition that opened that day. It was such a stroke of luck, because originally my mum and I were planning on visiting the portraiture exhibit from the Royal Collection (which we still did.) However, I was a little more excited for Takashi Murakami's: The Octopus Eats Its Own Leg exhibition. I am so glad we had the chance to go! It was truly amazing seeing how this contemporary artist works and the gallery did such a wonderful job in curating the exhibition. If you find yourself in Vancouver I highly recommend visiting it, the exhibit runs until May 6, 2018, so you definitely have some time left! This show was a major retrospective of the artist's work, spanning three decades of the artist's career. This presentation of Murakami's works displays over fifty works from his earlier works to his more recent pieces, as well as some works made specifically for the Vancouver Art Gallery's exhibition. This is the first time Takashi Murakami's work has been shown in Canada and display how the artist works with consistent themes. The artist's inspiration for his work range from cultural and historical, to present day pop culture. His earlier work adheres to a traditional Japanese style of painting, which he was originally trained in. He takes these techniques and formats and melts them with contemporary subject matter, like nuclear power and consumerism. As his art matured, so did his practice and he began working in his distinctive style "Superflat" concept. This style is his most recognizable and gave way to his most popular form, Mr. DOB, a mouse-like character that is part ambassador and part self-portrait for the artist. Murakami became quite wrapped up in the centre of luxury and celebrity culture, even designing the album cover of Kayne West's album Graduation. However, Murakami felt he needed to step away from the culture of consumerism and come back to his art in a new lens. This was also garnered by the earthquake and tsunami of 2011 that killed over 15,000 people in Japan. He felt deeply affected by this disaster that he returned to his training in the classics to find an answer. His research led him to the Buddhist culture and iconography, which he blends with both his historical and contemporary views of Japanese training. Even if you are not an art historian or art lover I would highly recommend visiting this truly amazing show. The colours and energy behind each piece are something everyone can enjoy. Book your tickets in advance, as the line up, especially on weekends, can be quite long to enter the gallery for this exhibition. Whenever I am traveling I check out what is happening at the local art gallery. Once Dave told me he was taking me to Portland for my birthday I had to look up what the art scene was like in Portland. Turns out they have an amazing art gallery and I quickly bought tickets online for our first day in the city. The Portland Art Museum is located in downtown Portland and it was very easy to get to by bus for us from where we were staying. They had a wide variety of exhibits on from animation to prints to their own collection. I took Dave to each and although we didn't have all day to spend in the gallery I felt like we took in a lot and really enjoyed it all. The current exhibition Animating Life: The Art, Science, and Wonder of LAIKA, I thought would be fun and something Dave might enjoy more then the usual Renaissance and Impressionist exhibits I drag him to. This exhibit was a fascinating way to view behind the scenes of this globally renowned animation studio. Visitors were immersed in everything that happens when making one of Laika's films. We were able to see behind the scenes photography, video clips and even physical artwork from its films. Parts of the production design, sets, props and puppets were there to look at more closely to see just how much work goes into a modern animation film. This exhibit was so much fun and educational into a world I had never really thought of before. It was great for Dave and I, both adults who still love to watch cartoons from time to time, but also for all the kids and families in Portland who might not normally be interested in the art museum. I would highly recommend a visit if you're in the area. The exhibition runs till May 20, 2018. Our next stop was the basement of the museum where they had a very different exhibit on: Kingdom Animalia: Animal Prints from Durer to Picasso. We really enjoyed this exhibit as well, I especially did since I work in an art gallery with mainly prints. It was interesting to see how artists work in the medium of print making and can be so different from one another. I was very excited to see pieces by Durer, Toulous-Lautrec, Picasso and Warhol to name a few. The exhibition will be on until May 13 and if you find yourself in Portland before then I would suggest you go! This exhibit was drawn from the museum's archives and offers a sampling of prints ranging in date from 500 years. After viewing two of the art museum's current collections we went upstairs to visit their European Art section, specifically the Renaissance and Impressionist pieces (my favourite.) At this point I think Dave had enough art for one day but I was just getting started. I found pieces by Courbet and Botticelli to name a few and I was in art history heaven. If I ever moved to a larger city, which at some point in my life I hope I do, I want to just spend a day in an art museum, with nowhere to go and nothing to do. I feel happiest surrounded by pieces like the ones I found in this part of the art gallery. It is something I can't really explain to someone who doesn't feel the same way as I do about art but it is truly phenomenal. The collection at the Portland Art Museum was awe inspiring and I am so glad I was able to spend some time there. Next time I am in the city I definitely plan on making a stop there again. A few weeks ago when I was in Vancouver for a wedding I made Dave go to the Vancouver Art Gallery to see Claude Monet's Secret Garden exhibition. The Vancouver exhibition is the only presentation of this exhibit within North America and I simply could not resist checking it out. Although we only had a short amount of time to visit, we managed to take it all in. The exhibition comprised of 38 paintings spanning the artist's long career. It was a look into the diversity of his subjects of art, from the portrayal of modern life in his early figure studies to his inventive treatment of light seen in his city scenes. These works capture his dedicated approach to capture the fleeting colours from varied light. The exhibition ended with a major series of paintings Monet did in his famous gardens in the town of Giverny, where he lived from 1883 to the end of his life. The series shows how important the constant exploration of plants and water was to the artists, even as he began to go blind at the end of his artistic career and his life. His imagery of weeping willows, waterlilies and the Japanese bridge in his garden are among the most iconic of Western painting today. The above image of London was my favourite of the exhibition and varied dramatically from the other paintings throughout this exhibition. London was Monet's favourite European city and this image of the Houses of Parliament is one example of his dedication to the varying light in a cityscape. Sometimes Monet would have numerous paintings he was working on at once and would go back and forth as the light changed to capture the light at that exact moment. The above image was the final of the exhibition and Monet finished painting it the year of his death. It is bigger and more colourful than others in the gallery, and equally beautiful. The garden remained Monet's muse until his death, a testament to the power of nature and art. If you do one thing this summer in Vancouver make it this exhibition. The crowds were large and the gallery was filled up but it was worth every moment. Be sure to book your tickets online to avoid the winding ticket lines. The exhibition runs to October 1st 2017. Salvador Dali's Dance of Time I. was conceived in 1979 and first cast in 1984. The bronze sculpture is 83 inches tall and weighs 860 pounds. This piece by Dali was made in the lost wax method technique and there were 8 editions plus 6 artist proofs. Last weekend while visiting Vancouver I made it one of my goals of the weekend to go see this melting clock motif, the most iconic of Dali's images. The piece is located downtown at West Hastings and Hornby Street and will be on display until September. As a public piece many people pass it without even glancing towards it, however, that was not the case for me! The write up beside the piece explains to the viewer Salvador Dali as an artist and about this piece and how he was intrigued by time as a concept. Salvador Dali was fascinated by time and it followed him throughout his life, making an appearance in numerous of his works. This melting clock motif seen here in Dance of Time I. is a representation of duality between time and timelessness. It takes the viewer into Dali's world, where imagination and time are limitless. The artist makes us confront the limitations that we force upon our perception of reality. Whether you love or hate this piece or any of Dali's work for that matter, you simply cannot pass by indifferently. Elyse Longair, originally from Lethbridge, AB, now resides and works out of Victoria, BC. A very close friend I am always interested in what artistic projects she is working on. Although she keeps quiet about her work, after some convincing she let me write a post about the piece she is currently showing. Between Atoms can be viewed in Odeon Alley in the Ministry of Casual Living Window, until Friday March 3rd. Elyse works in different mediums and styles. These three are digital prints of her collages she has been working on of late. She has also worked in print making, as well as large canvas paintings. Her tumblr account: fauxfern.tumblr.com/ is a beautiful view into her inspiration and is like looking through a museum archive. Instead of doing an interview for this post, Elyse would rather have me try to understand the work in the way I see it. When I look at this piece I see a little boy in the centre, peering out through a mail slot, however, he isn't looking out on to any normal street. Rather he looks out into three different realities, perhaps choosing what his life will be and where it will go. Of course, this is just my viewing of the piece, and I am sure the artist probably had a very different idea when she collaged the piece. I hope that when you visit this piece in Odeon Alley and look at it, with all its reflections bouncing off the window, you see it for something else, whatever you please. In January when Dave and I were in Dublin we visited the National Gallery of Ireland to see the 'January Turners.' While we were visiting the gallery, Dave and I stumbled upon another exhibition, Creating History: Stories of Ireland in Art. This exhibition featured paintings inspired by Ireland's past. While many of the works were historical pieces, others were romantic mythologies, or even political pieces. The exhibition was arranged thematically, bringing art together that had been produced in different periods, from sometimes opposing perspectives and in completely different styles. The paintings ranged from the 17th century to the early years of the Irish Free State. The categories: Testimony, Conflict, Assembly, Allegory, Lamentation, were created to draw out the connections between the works of art. Many of the artists in this exhibition were not even Irish, however, recognized the drama in Ireland's remarkable history. While Dave and I walked around the exhibition I realized how little I knew about Irish history and found it fascinating to learn about it through visual representations and storytelling through art. My favourite works were by an Irish artist I had never heard of, Sean Keating, an Irish romantic-realist painter who painted some iconic images of the Irish War of Independence and of the early industrialization of Ireland. Keating addressed the War of Independence and the Civil War in several paintings. This painting shows three young men resting in a rural yard: one cleans his revolver, another reads a paper and the third seems to be daydreaming. The setting is one that gives us an insight into these three men, who are in hiding, with no real shelter but a shed that is falling apart in the background behind them. There are various domestic items suggesting the kindness of the people who are hiding them. Members of the IRA relied heavily on a network of safe houses across the country: places they could rest and be concealed from the authorities, if need be. While I was in Dublin I had the pleasure of visiting the National Gallery of Ireland, http://www.nationalgallery.ie/ to see a collection of 31 watercolours bequeathed to the Gallery by the art collector Henry Vaughan in 1900. The conditions of Vaughan's was that the drawings should be: 'exhibited to the public all at one time free of charge during the month of January.' These conditions are still adhered to today and as a result the works have remained in good condition, with their vibrant colours. I was lucky enough to have had the chance to admire Turner's pieces at the beginning of January before leaving Ireland. J. W. M. Turner (1775-1851), was an English Romanticist landscape painter. During his artistic period, Turner was considered controversial, however, today he is renowned for taking landscape painting and elevating to match that of historical painting. Although, he is most well-known for his oil paintings, he was also a great master of watercolour, as seen in the collection in the National Gallery of Ireland. Turner's talent was recognized early in his career, which gave him financial independence, unlike many artists of his day. The art critic John Ruskin described him as as the artist who could most "stirringly and truthfully measure the moods of nature." Pablo Picasso, Femme au Collier Jaune, 1945, Oil on Canvas. The Vancouver Art Gallery held an exhibition this past summer, from June 11 to October 2, displaying works by one of the most famous artists of the twentieth century, Pablo Picasso. Included in the exhibition were some 160 paintings, drawings, sculptures and prints from some of his most prolific artistic periods of his life (1905-1971). The pieces that were borrowed from both public and private collections overlapped his love affairs as well as his styles of art marking. Picasso: The Artist and His Muses, was the most ambitious exhibition of Picasso works ever shown in Western Canada and I was so lucky to have made it to Vancouver to see it days before it closed. As I walked through the gallery with the hundreds of people filling out each room, I looked on and tried to understand what the curator was telling me through the exhibition. What the curator proposed is that six women, known as Picasso's muses, had a profound influence on his work. Each period, which he spent with each woman, and lasted roughly ten years, triggered important stylistic and conceptual changes in his work. The exhibition did a wonderful job of displaying Picasso's mastery of so many styles and forms. However, it also displayed how his fame and fortune affected other aspects of his life, specifically the women. As his fame increased as did the age difference between him and his lovers. This aspect of the exhibition, presented some issues, revolving mainly around his "romances" or inspiration from his muses. The exhibition explained his relationships with his muses as collaborative within his art making, however, this may not be true as they were often imbalanced. Not all his exes fared as well as one, Francoise Gilot, who became a successful painter after leaving him. Whereas Dora Maar, one of his lovers, was hospitalized for depression after their breakup and both Marie-Therese Walter and Jacquline Roque committed suicide after the artist's death. Overall it was a beautiful and moving exhibition, despite some depressing notes that were mostly glossed over and romanticized in one way or another. Pablo Picasso, Weeping Woman, 1937, Etching, Drypoint, Engraving, Aquatint on Laid Paper. Pablo Picasso, Bust of a Woman, 1938, Oil on Canvas.